Our deep powder counterparts at Snowmobile.com gave you their hands-on reasoning for their choices for the Best of the West sleds. Now it’s our turn to look at what we’ve learned, thought about, ridden, liked and didn’t like. Some of the sleds impressed us more than others. And, we can truly say without any doubt that there are no bad sleds. Some we would prefer more than others, but unlike the early days of snowmobiling, there are no longer crap sleds. What the dealers have in their showrooms is all good, for someone. As you will notice, we are taking a bit of a different approach this year. We aren’t simply basing our choices on pure mechanical superlatives. In some case we are looking at the impact a sled may be making now and possibly into the future. The reason for that is simply that model year 2014 reflects more of an “evolvement” than a breakthrough. But, you’ll see that as we move on and introduce you to our 2014 Editors’ Choices. We’ve been in this snowmobile business a long, long time and have never seen anything quite like the Yamaha Viper program. Yamaha’s entering into a manufacturing and sharing partnership with Arctic Cat is quite unique in the history of the sport. Yes, Cat and Kawasaki had a deal to build Sno-Jets. Yes, Cat and Suzuki combined to build the Suzuki Fury. But none matched the gamble that we see Yamaha taking in its deal to share technologies with a bigger volume competitor in the snowmobile market. Do not for a second underestimate the impact that this arrangement can have. You have the bringing together of two companies with quite different corporate philosophies. Yamaha is exactingly rigid in its methodology and expects long periods of research and testing before it allows a product to reach the consumer. Arctic Cat has its processes as well, but it tends to move product from concept to the snow much more quickly. There could have been, and we admittedly expected, a bit of shove-back by dealers, consumers and even the two players themselves. But the reaction that we’ve seen from Yamaha and Arctic Cat dealers as well as consumers has been extremely positive. Yamaha dealers feel as though they have a good handling sport sled with known Yamaha power. Consumers loyal to Yamaha jumped on board because now they have a lighter, quicker, all-new (to them, at least) snowmobile that retains legendary Yamaha power that is reliable and durable. We thought about naming the Yamaha Viper and Arctic Cat ZR7000 as co-snowmobiles of the year, but when we thought about it, we realized that Yamaha was taking the bigger gamble. In some ways, the Arctic Cat is simply adding a new engine to a successful chassis. Yamaha, though, is taking on a new way of doing business. That, for us, is what makes the Yamaha SR Viper our 2014 Snowmobile of the Year. Give Ski-Doo credit for keeping two-stroke performance sleds in the sport. This high-performance Rotax-engineered E-TEC series of Twins gives longtime snowmobilers the throttle action they want and get it to a long-ish track for excellent on- or off-trail riding. 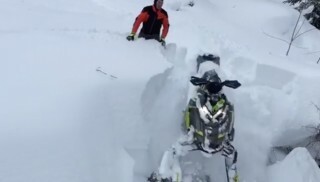 We like what Ski-Doo has done with its top of the line off-trail snow buster. You get a very supple front end and an extremely tunable rMotion rear suspension, available with external adjusters if you choose. We enjoyed the benefits of a 600cc Renegade last riding season and admit that long term experience allowed us to understand the sled better. With any 800cc powerplant and more than 150 horsepower, you need a sled that can translate the trail via its feedback. The rider-forward position, which Ski-Doo pioneered, does that. The handlebar feedback is instant. You can turn into a corner almost as quickly as with a short tracked MXZ, but you will outmaneuver that MXZ where the snow piles up and you need extra track action. The Renegade gives it. There are very good choices in this category. Polaris offers a top of the line 800 Switchback Pro-R with Walker Evans shocks. Arctic Cat’s turbo powered XF 9000 brings the most power, but on balance, the Ski-Doo blends in excellent E-Tec efficiency with top-drawer features and extremely capable ride-ability. Big bump, snocross racer wannabes drool over the features found on Ski-Doo’s MXZ X-RS 800 E-TEC. Tall and wide racer handlebars complete with curved end grips give you ample control in the rough to throttle up on the direct-injected Rotax 800cc two-stroke Twin. Based on the tighter and lighter REV-XS RS race chassis, the X-RS gets a complete set of all things race-able. The shocks are top line KYB Pro 40 series that can be quickly adjusted. You’ll find that quality on the highly tunable rMotion rear suspension as well. The runningboards and seat provide a sturdy riding platform to tame big berm runs or a wide-open dash down a rutted out trail. And, yes, this top line big bump sled offers civility with in-seat storage, electronic reverse for loading and off-loading from your trailer. 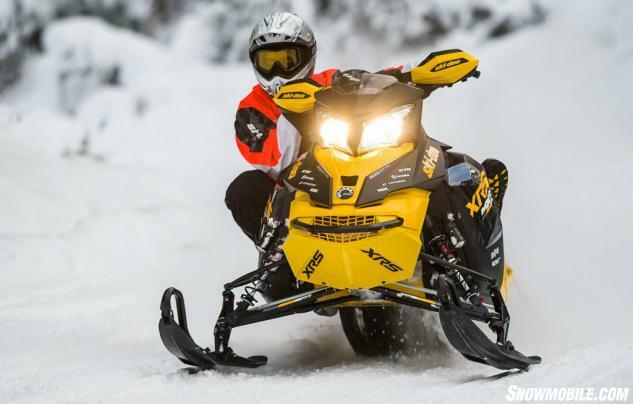 Outfitted in Ski-Doo’s traditional racer garb of black and yellow-painted tunnel, the XRS stands out and assures that its rider stands apart on the trail. The XRS comes fully equipped with a digital multi-function gauge as well as a famed Brembo disc brake with braided stainless-steel brake line. This is the same brand of brakes found on high-performance road cars like the Aston Martin DBS, Porsche Carrera, Corvette ZR1 and Ferrari 458. 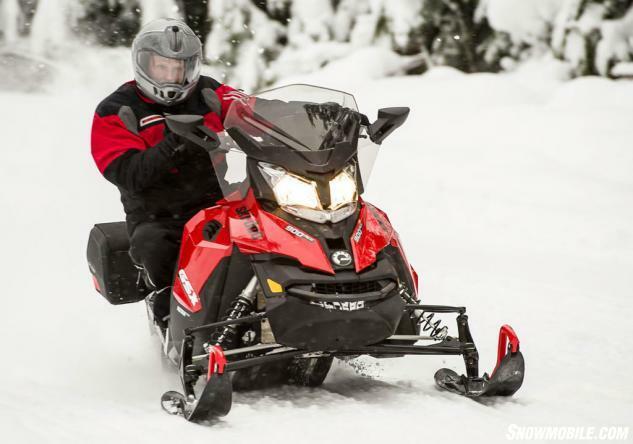 The XRS is a very seriously outfitted high performance snowmobile and that’s why we choose it as the High Performance sled of the year for 2014. We like our fan-cooled, lightweight, toss ‘em about play sleds, but we think that the addition of Yamaha power to Arctic Cat’s ProCross chassis creates a whole new level of fun-to-ride snowmobile, the ZR 7000. We would prefer our ZR in Sno Pro get up to take advantage of the stiffer setting and more tuned for action trail riding that we like. We came away from our new model preview and weeklong riding soiree back in early March with a new appreciation of just how good these trail Cats really are. And we came away with a whole new respect for what Yamaha has been hiding in the bowels of the Nytro. Yamaha’s one-liter four-stroke Triple was amazing – in the ZR 7000 body works. Keeping in mind that this is the same engine but in a different chassis, we found that Cat’s ZR 7000 is all things that the Nytro is not. The ZR 7 is lighter, more responsive, better handling, better riding, and so much easier to live with on a day-to-day, mile-to-mile basis. We even found ourselves believing that the ZR 7000 was a two-stroke, it was that responsive. 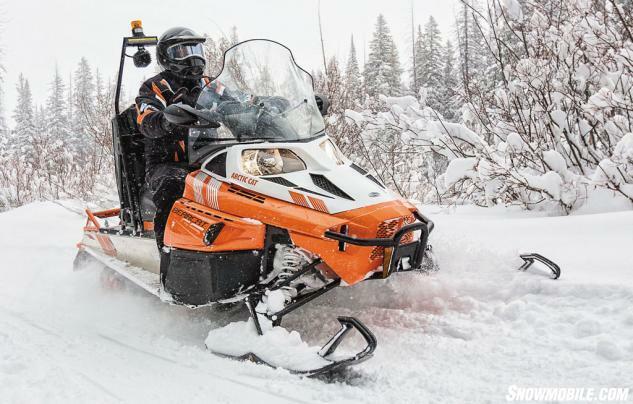 Granted that Arctic Cat has had a three year head start on getting the chassis to work before putting the Yamaha Triple in it, but we never knew that the 135-horsepower Yamaha fuel-injected Triple could be so much fun in a sled that seemed stodgy and underpowered with the similar displacement Suzuki four-stroke Twin. The Yamaha engine is lighter, more powerful and let’s you know it. We do like our fan-cooled low horsepower toys, but given the choice of spending all day, every day on the trails with the ZR 7000… well, it’s not a contest, is it? 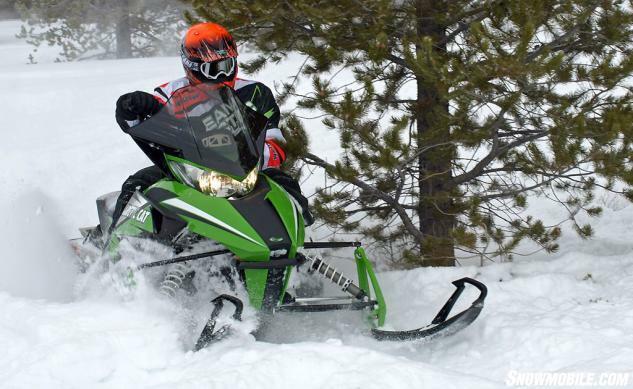 The Arctic Cat ZR 7000 Sno Pro gives us great joy. We can appreciate the value of Ski-Doo’s smooth and quiet GSX for 2014, especially when outfitted with the ACE 900 four-stroke Triple. 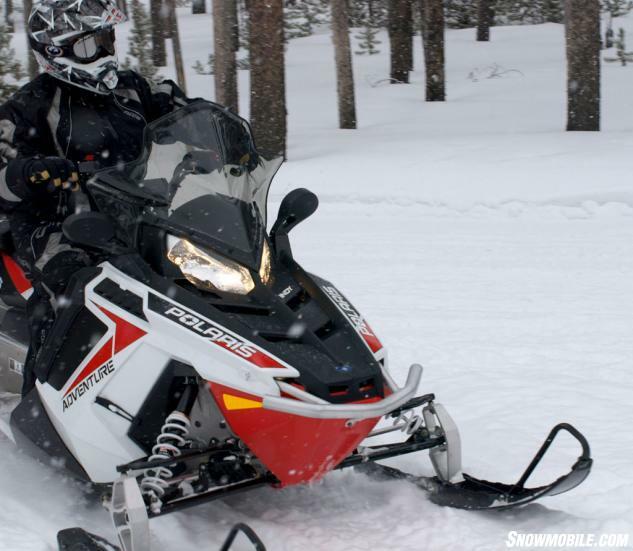 For us, the GSX ACE 900 seems to be the perfect solo luxury sport sled. The chassis and new four-stroke motor complement each other and perfectly meet expectations of a long haul sporty cruiser. At 90 horsepower the ACE 900 doesn’t seem like much when compared to a 600 E-TEC two-stroke with greater power, but the ACE 900 delivers excellent “down low” power that a serious cruiser seeks. It is a smooth runner, harnessing its torque through a new version of Ski-Doo’s eDrive2 power delivery system. Drive-offs and mid-range acceleration are smooth and work well with the sled’s easily adjustable rMotion ride suspension. Designed to run with 87-octane fuel, the ACE 900 is claimed to provide 20-plus miles per gallon. With its 10.6 US gallon fuel tank, you should net more than 200 miles of cruising on a single fill up. If you want to stretch fuel economy, dial in “eco” on the multi-stage programmable performance modes, which also includes “normal” and performance settings. As a traditional Ski-Doo sport luxury cruiser, you can expect niceties such as an expandable tunnel bag, windshield with integrated wind deflectors, standard electric start and reverse as well as a multifunction gauge. This sled comes on the same REV-XS chassis as the performance-oriented MXZ, so you can count on sporty as well as cruiser reactions. Ski-Doo does sport cruising extremely well and our choice for personal sport touring sled for 2014 is a natural, more so when you add in the new ACE 900 power package. Choosing the 550 Indy Adventure from Polaris seems crazy, at first. After all, everyone knows that Ski-Doo make the best two-up grand touring sleds ever. Can’t disagree, but think about the 550 Indy Adventure in bigger terms. It’s lighter, less expensive, fully featured and more apt to appeal to someone on a budget. At less than US$8,500, the Adventure sits poised to invite more people to share in the sport than a luxury barge costing thousands more. Most likely the Adventure will end up as a rental sled. But if you were a snowmobiler with a young family or a young guy with a girlfriend, you can share the ride without breaking the bank. If you’re a grandpa, you can share winter with a grandkid. Hey, you can even share time with Grandma! The point is that snowmobiling wants to be a family sport. It’s a sport that has always been shared. 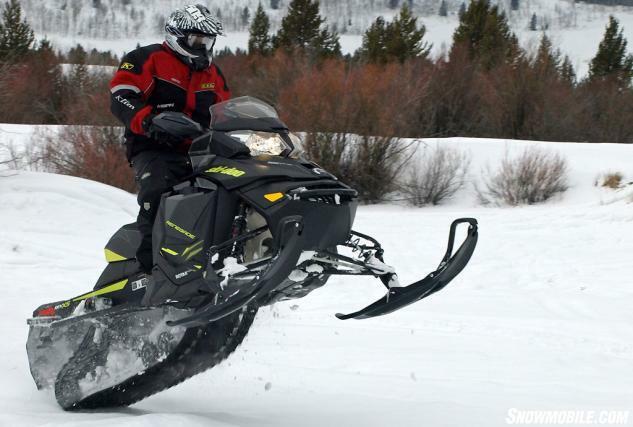 How do you share snowmobiling on an MXZ XRS? Fast and furious isn’t the answer. Accommodating works and the 550 Indy Adventure is very accommodating. It’s simple. There’s the 550cc Fuji fan-cooled Twin and simple, yet effective Powerbloc clutching. The windshield sits tall enough to protect the ones you want to invite into winter. There are storage areas and a comfortable Lock & Ride convertible passenger seat. Ease of operation with electric start and electronic reverse add to the on-trail cruising enjoyment. Simple and effective. Built around a proven chassis and fitted with a coil-over-spring rear suspension and race-tested front A-arm suspension, the 550 Indy Adventure provides solid long distance capabilities. We look at the 2014 Polaris 550 Indy Adventure as an invitation to winter vehicle that offers riders a chance to share the sport in a fun and simple manner. Like in the “old” days when clubs got together for a day’s ride to enjoy simple pleasures like a trailside wiener roast. The Adventure makes a great choice for bringing people together. When it comes to utility sleds, the 2014 Arctic Cat Bearcat Z1 XT GS exceeds the need. It is a unique snowmobile that can work in the boondocks or be used as a trail groomer. It is uniquely outfitted to any rugged task. With a 125-horsepower 1100cc Suzuki four-stroke powerplant, the GS is geared for work. It comes ready with a heavy-duty rear bumper that includes a hitch. The light bar and beacon let you stand out on the trail or in the backcountry. The under-seat storage offers ample space for saws, axes, ropes and whatever else you need to carry. Built on the older Twin Spar platform, the GS can be outfitted with an engine heater and equipped with a winch. This is a serious utility machine. But you will find pushbutton reverse, electric start, heated grips, mirrors and an articulating rear suspension to take the “wild” out of wilderness. Arctic Cat designed this sled for serious work and we choose it as our 2014 Best Utility Sled. So, there you have it, the sleds that made our short list for 2014. We could make cases for other sleds, but we took a look at not just the pieces making up the sled, but how we thought each sled fit in. Agree or disagree, that’s what makes the sport interesting.